Māori have urbanized rapidly over the last century, undergoing a general disconnection from the environment. To buck that trend, members of the Tūhoe tribe in the community of Ruatāhuna, New Zealand, have been teaching their young people about their traditional culture and forest knowledge. They’re changing the format of their local schools to reflect a Tūhoe worldview, and have set up a “forest academy” for teenagers. This is the third part of Mongabay’s three-part profile of the Ruatāhuna community’s effort to restore their ancestral forest. Read other stories in this three-part profile of the Ruatāhuna community’s stewardship of its forest. What makes a forest healthy? Māori knowledge has some answers. RUATĀHUNA, New Zealand — Like many young people growing up in small-town New Zealand, Ātamira Nuku, age 29, couldn’t wait to leave home and start a new life somewhere bigger and busier. She got married, had a baby, and left the isolated, predominantly Māori village of Ruatāhuna in the Tuawhenua area of Te Urewera forest for the shiny shores and higher wages of Australia while she was still a teenager. Upon their return, the couple found work in an ecotourism outfit, taking people on treks around Te Urewera, which at 2,127 square kilometers (821 square miles) is the largest remaining tract of indigenous forest on New Zealand’s North Island. Through that work, Nuku learned more about the forest she had grown up surrounded by, and developed a strong sense of responsibility toward both the land and its people. 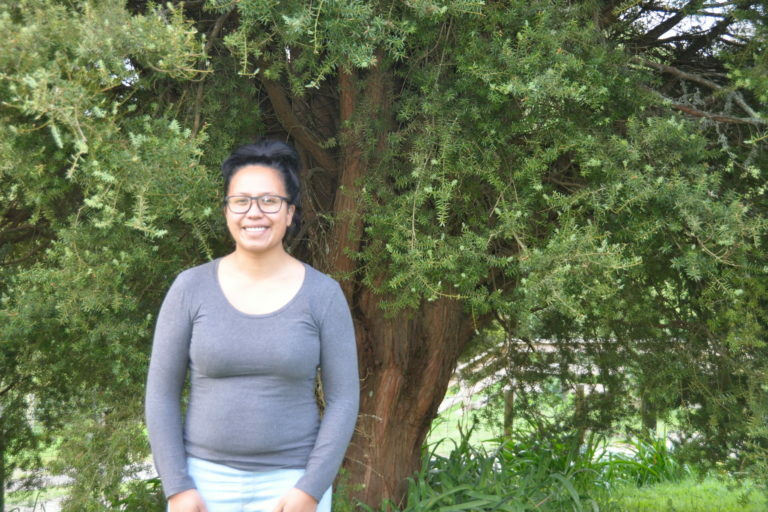 Ātamira Nuku stands in front of a tōtara tree (Podocarpus totara). Image by Monica Evans for Mongabay. In many ways, Nuku’s decisions buck wider trends. Māori have urbanized rapidly over the last century, and in 2013, 84 percent of the population lived in urban areas. Within Tūhoe, the iwi (tribe) that calls Te Urewera home, the statistic is similar: of an estimated 33,000 to 45,000 living members, only around 30 percent still live in their tribal homelands. And even among the 300 or so mostly Tūhoe residents of Ruatāhuna there’s a general trend of disconnection from the environment. “There’s a generation here who just missed everything,” says Nuku, referring to the people who grew up between the 1950s and 1970s, when pressure to assimilate into the national economy and education system was particularly strong. Then, in the 1980s, the kura kaupapa Māori (Māori-language immersion school) movement emerged, and Ruatāhuna set up its own kura kaupapa and kohanga reo (Māori-language immersion preschool; literally “language nest”). Elders in Ruatāhuna were influential within that system, so they were able to transmit some of their understanding to younger generations like Nuku’s. But given what was lost in the generation before, “there’s still a big gap in our knowledge of who we are,” Nuku says. 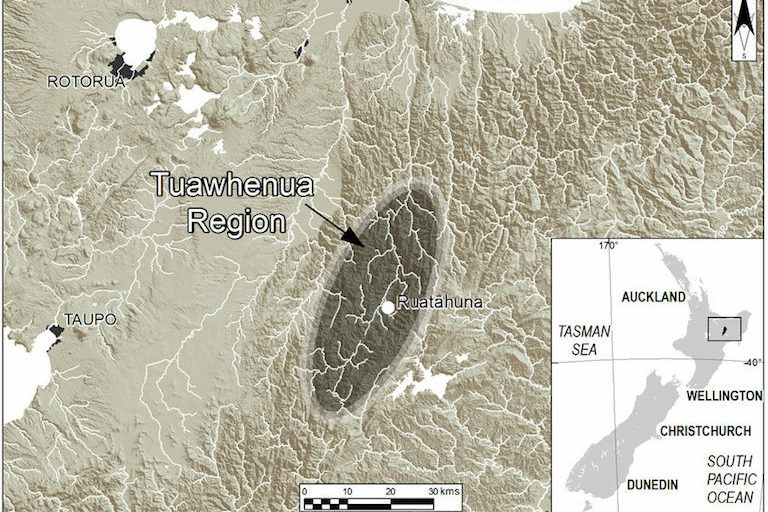 Location of the Tuawhenua region and community of Ruatāhuna within the forested mountainous region of Te Urewera on the North Island of New Zealand. Image courtesy of Lyver et al. 2017. She felt constrained working within the Pākeha (New Zealand–European) school system, which she felt was “not meeting the needs of our people, and not allowing us to teach the things that we hold really dearly and we value.” So when she finished that job, she joined the Ruatāhuna school board, where she began to pursue the thread of helping the younger generations revive their relationship to the land and community. Can they do this kind of reform while still “ticking the boxes” for a state school? “Well, we actually want to get to a point where we don’t have to tick any boxes that are not our own,” says Nuku. So the group has begun exploring the possibility of coming away from the Ministry of Education altogether, and seeking iwi funding instead. “There’s a lot of discussions that are happening in terms of where the school is heading to in the next 10, 20 and 50 years,” she says. 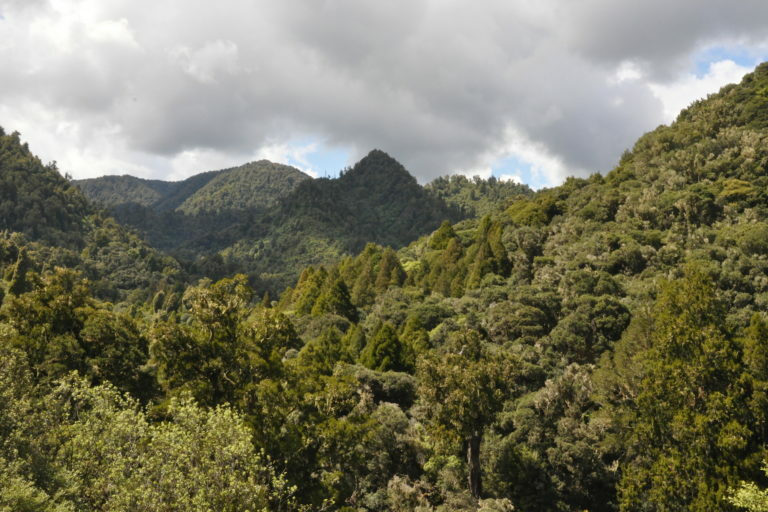 A view of the forest around Ruatāhuna. Rimu trees (Dacrydium cupressinum), a native member of the coniferous Podocarpaceae family that the Ruatāhuna community is trying to restore, emerge through the forest canopy. 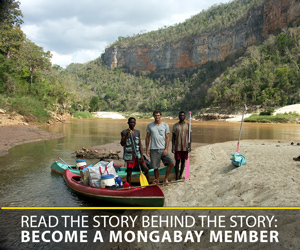 Image by Monica Evans for Mongabay. For older youth in the valley, there’s another program. It’s run by the Tūhoe Tuawhenua Trust, a local group that manages 25 blocks of land spanning about 90 square kilometers (35 square miles), or 45 percent of the total Tuawhenua area. It’s a “forest academy” for teenagers, an intensive bush-based program taught by local experts in ecology and Tūhoe culture. The first academy took place over four days during school holidays this July, with 12 participants ages 12 to 18 who were selected by their hapū to participate. The Trust has just secured funding to run seven more academies during school holidays over the next 18 months. Te Whare o Rehua is the name of the program, and it’s not given lightly. The term whare (house) refers to the way Māori are traditionally strict about using different spaces for different purposes, such as eating, sleeping and learning. “We wanted to use that model of a specialized academy for a special purpose,” explains Puke Tīmoti, who is one of the program’s educators. Rehua is a sky god represented by the constellation of Antares, and the story goes that the forest god Tāne ascended to heaven on a quest for knowledge and met Rehua, who gifted him three calabashes of knowledge to bring back down to Earth. So Te Whare o Rehua is a specific place for learning traditional knowledge of the Tuawhenua forests. 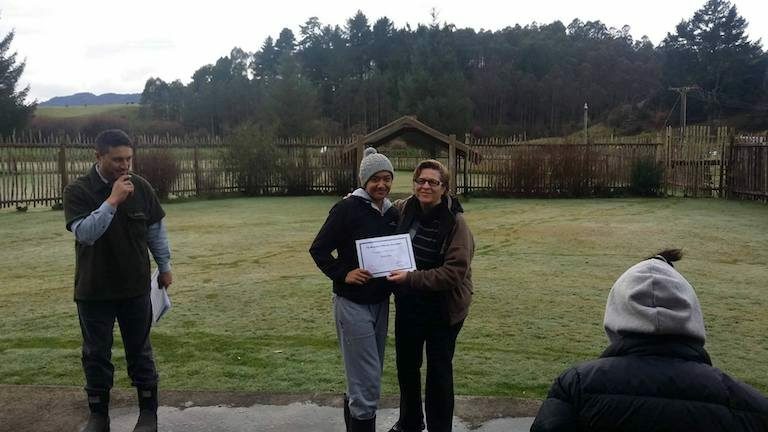 Brenda Tahi (right) and Puke Tīmoti (left) present a completion certificate to a Te Whare o Rehua forest academy participant. 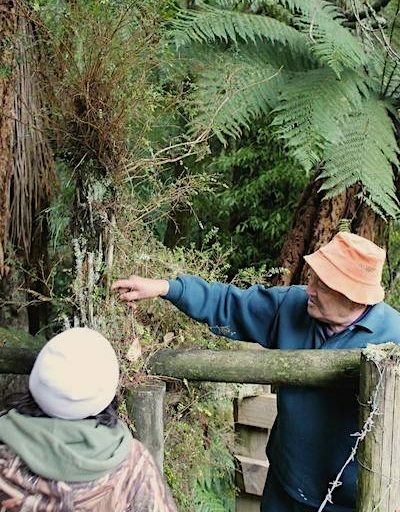 Tahae Doherty, chair of the Tūhoe Tuawhenua Trust and a forest expert, shares knowledge with a young person as part of the Te Whare o Rehua forest academy program. Image courtesy of Tūhoe Tuawhenua Trust. They also go walking in the forest as a family — “which might be four-to-five-day treks, or just little 30-minute walks when we can fit it in between everything else we’re doing” — and have involved their kids in pest-control excursions and a small wetland restoration project in her husband’s village further down the river, too. Nuku hopes that when her kids grow up, “they’re grounded in the identity of who we are as descendants of Hine-pūkohu-rangi me Te Maunga,” the Mist Maiden and the Mountain Man of Tūhoe creation mythology. “I hope they’ll have some knowledge of what they need to do to protect and care for the land, and that the land will still be able to care for them too,” she says. There’s a universal element to her aspirations, too. “Mostly I just want them to be happy, healthy humans, with a beautiful home. It’s so good to be able to come home,” she says. 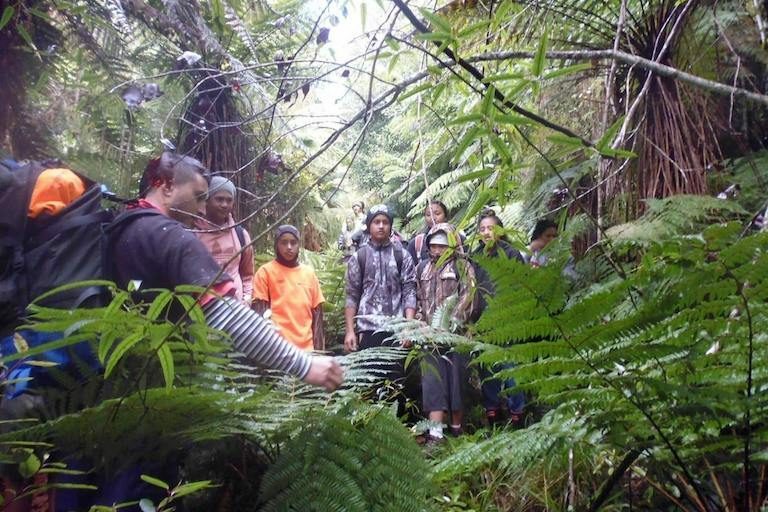 Puke Tīmoti helps local rangatahi (young people) make connections between cultural knowledge and science through the Te Whare o Rehua forest academy program. Image courtesy of Tūhoe Tuawhenua Trust. Monica Evans is a freelance writer, researcher and community development practitioner. She lives in a small town on New Zealand’s wild West Coast.